Comes with 2 stanchions! 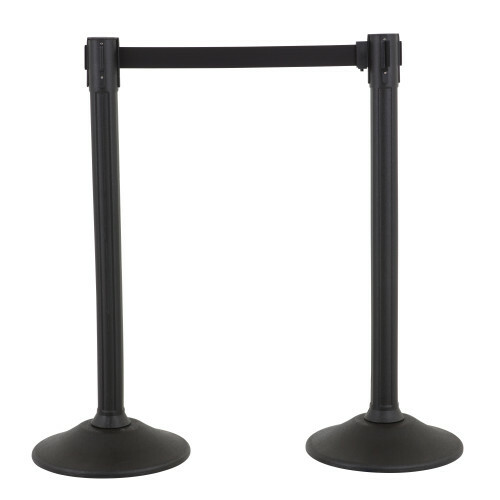 The Sentry is unchallenged as the most durable and affordable stanchion in its class. Made in the United States, the Sentry post and base are made of high density polyethylene that is scratch-resistant and incredibly durable. The innovative assembly features Easy Connect, a snap together connection between the post and base that requires no tools for fast and easy assembly. The post stands at 38.5-inches tall and features a reinforced shoulder post design for added strength to keep the post standing straight. Supporting the stanchion is a 15. lb. weighted base with six no-skid, non-marking rubber feet to keep the stanchion in place, even with large crowds. The Sentry features a 6.5-foot woven belt with a safety braking system for slow and safe belt return. Each 2.875-inch diameter post also features 3 belt receptacles to facilitate a 4-way connection to other posts. These receptacles feature a safety locking mechanism to keep the belt securely fastened to the post and prevent accidental belt retraction. The Sentry features a universal belt end that will fit almost any known stanchion on the market. US Weight, located in Olney, Illinois, introduces the most durable and affordable stanchion in its class with the Sentry.